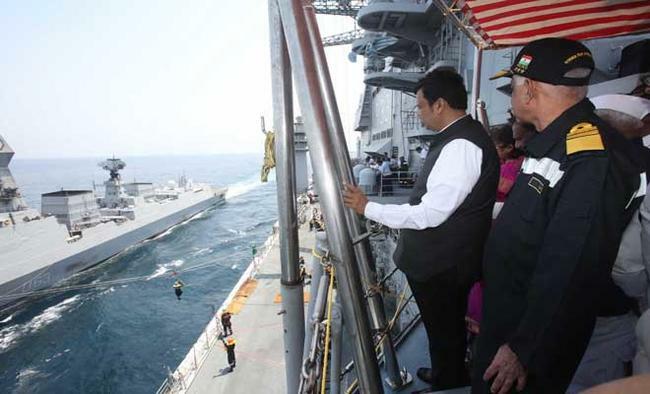 Mumbai: Chief Minister Devendra Fadnavis, top legislative functionaries and elected people's representatives witnessed a demonstration of naval exercises during a 'day at sea' organised by the Indian Navy here on Wednesday. 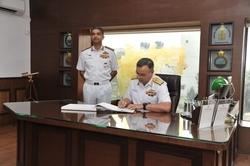 The unique and unprecedented event was planned in accordance with the directives of Prime Minister Narendra Modi "to maintain close interaction between the elected representatives and state government officials of all coastal states with the Indian Navy", said an official spokesperson. This was the first time such an event was attempted. Now similar ones are being planned in the near future for leaders and elected representatives of all coastal states, he added. 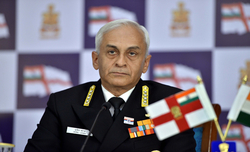 Western Naval Command chief, Vice Admiral Girish Luthra hosted the top officials who embarked various frontline naval warships in the morning, including aircraft carrier INS Vikramaditya, INS Chennai, INS Kolkata, INS Trishul and INS Teg of the Western Fleet. 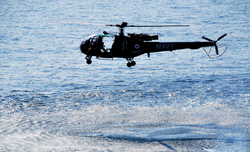 An exciting live operational demo and exercises were witnessed by the dignitaries by the participating ships and submarines including the recently-commissioned INS Kalvari, missiles demo by INS Vidyut, and search and rescue demo by helicopters, providing a deep insight into the complexities of rescue operations at sea, said an official spokesperson. Shipborne Anti-Submarine Warfare Seaking, AEW Kamov helicopters, MiG 29K carrier borne fighter aircraft, participated in a thrilling air power demo.Luthra and other senior naval officials also briefed the visitors on the role and scope of operations of the command on the high seas, on the aircraft carrier. 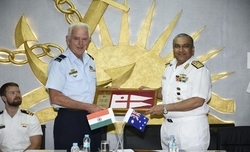 On his part, Fadnavis lauded the role of the armed forces in safeguarding territorial, maritime and economic interests of the country, acknowledged the gallant services of the naval personnel to the nation with professionalism and fortitude in the challenging environments of the high seas.Besides Fadnavis, other notables on the trip included Assembly Speaker Haribhau Bagade, Legislative Council Chairman Ramraje Naik-Nimbalkar, several Lok Sabha and Assembly members and senior government officials.